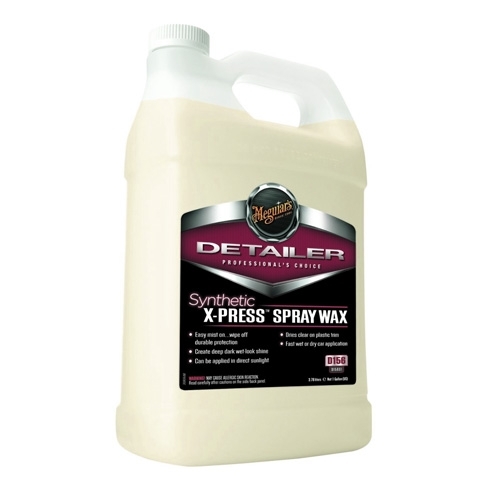 Meguiar's Synthetic X-Press Spray Wax, D15601 - 1 gal. Meguiar's X-Press Synthetic Spray Wax - Easy mist on wipe off… durable protection. Creates a deep dark wet-look shine. Fast wet or dry car application - dries clear on plastic trim. Meguiar’s Synthetic X-Press™ Spray Wax is formulated utilizing unique Hydrophobic Polymer Technology™ to produce a durable deep rich gloss with easy application and instant wipe off. Shake Well. For best results apply to clean surface. Mist product onto one section at a time. Quickly spread product with a clean Meguiar's Ultimate Wipe Detailing Cloth (M9910) and immediately wipe with a second dry Ultimate Wipe Detailing Cloth. Do not allow to dry on the surface. May be applied to a wet vehicle after rinsing. Mist on wet car and proceed with drying towel/chamois. Apply to paint, glass and chrome for durable hydrophobic protection. Use Microfiber Mitt (X3002) for initial wipe followed with final wipe of Ultimate Wipe Detailing Cloth. Also great on painted wheels. If you get streaks just give the surface another pass with a fine mist of the Synthetic X-Press Spray Wax and maybe work smaller areas at a time. This will greatly reduce or completely remove any of the streaking.